Federal Minister of Border Security and Organized Crime Reduction, Bill Blair speaks as British Columbia Attorney General, David Eby looks on during a news conference in Vancouver, B.C., on Tuesday, Jan 22, 2019. 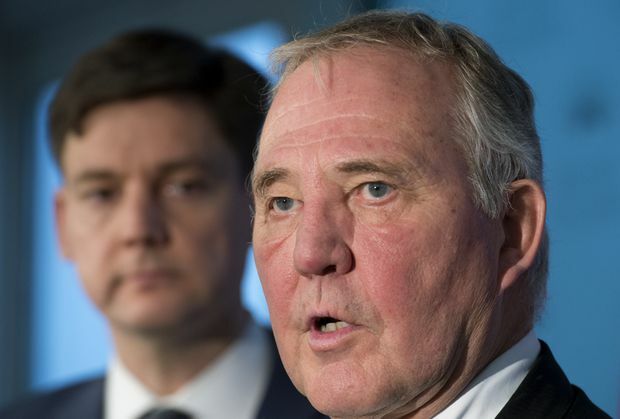 Bill Blair met with B.C. Attorney-General David Eby Tuesday as British Columbia reviews a regulatory regime so porous that transnational criminal syndicates appear to be operating with impunity, laundering money through the province’s casinos and real estate. Mr. Eby said an immediate improvement was having RCMP officials agree to meet with Peter German, the former RCMP deputy commissioner in charge of B.C. 's money-laundering review, and hand over a secret 2016 intelligence report that estimated international and local gangsters laundered more than a billion dollars through Metro Vancouver’s luxury housing market in one year. “We’re starting to see some progress on this issue. I credit Minister Blair’s office on getting that information flowing and I know it’s both of our expectations that it will continue to flow," Mr. Eby said. The first leg of Mr. German’s review, published last summer, focused on the casino sector and provided a “very conservative estimate” of $100-million a year being laundered by criminals, Mr. Eby said. In a new civil forfeiture lawsuit, the RCMP allege a Richmond, B.C., operation that recently had numerous criminal charges against it stayed was laundering $220-million a year for local drug dealers, as well as wealthy gamblers from China and clients in Mexico and Colombia. A July, 2018, case study by the G7-led Financial Action Task Force alleged the Richmond outfit was part of an underground banking network laundering more than a billion dollars a year in illicit drug and gambling money. Earlier this month, Mr. Eby told The Globe and Mail that the collapse of that high-profile criminal trial shows that a dearth of federal resources for investigating money laundering is masking the full extent of the problem. Last week, the former head of a B.C. RCMP organized crime unit told The Globe that Canada needs a new strategy to fight transnational gangs, must improve the legal framework informing these sophisticated investigations and must better deploy the RCMP’s resources to confront the serious threats posed by these international criminal networks. Mr. Eby praised Mr. Blair’s willingness to tackle this problem but noted that if there is not enough federal co-operation his province may order a public inquiry. He said that option is not as appealing as making changes based on Mr. German’s recommendations, noting B.C. has already shifted the enforcement of gambling laws away from the casino regulator in order to crack down on suspicious transactions.